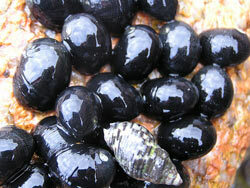 There are up to 85,000 species of Gastropods with about two thirds marine. These animals are commonly called snails and slugsand are the largest and most varied group of Molluscs. The name Gastropds comes from the Greek words, gastro (meaning stomach) and poda (meaning foot). Gastropods are found in a very wide range of habitats - woodlands to deserts; freshwater to intertidal zones to the ocean depths and hydrothermal vents and many which are parasites to other living things. They can range in size from less than 1 mm to over 80 cm. Gastropods usually have a well-defined head with two or four sensory tentacles, a calcium carbonate shell, usually spirally coiled into which the body can be pulled back, and a muscular foot on their lower surface. 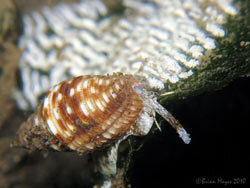 Marine gastropods can be herbivores, detritus feeders, carnivores, scavengers or parasites. 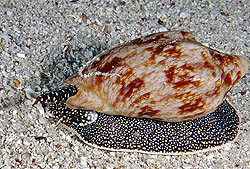 Most Gastropods have a muscular crawling, flat foot used for (slow) movement. 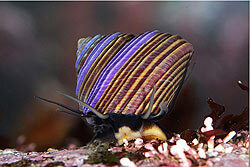 Some species use the foot to dig, other species, like the nudibranchs, are free swimming. The upper pair of tentacles have eye spots while the smaller, lower tentacles usually have organs for smelling. Most species have four tentacles. Gastropod radula's vary considerably as the diets of gastropod's are so varied. 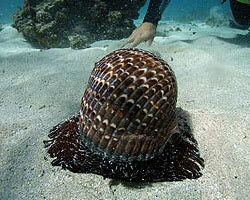 Many marine and freshwater water and few terrestrial species of snails foot's have a "lid" or "trapdoor" (operculum) at the rear of their foot. 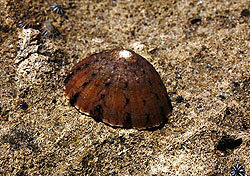 The operculum seals the shell when the snail withdraws into it. 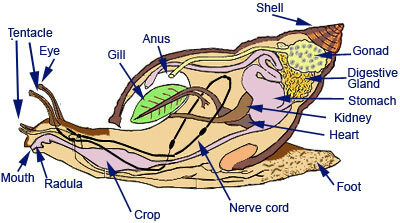 The shell protects the internal organs of snails. 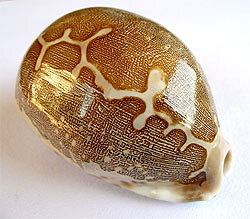 The shell, mainly composed of calcium carbonate, is produced by cells in the mantle. 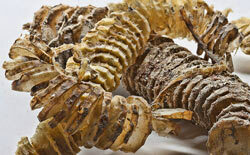 The shell is nearly always one piece and is coiled or spiraled with the coil usually opening on the right-hand side. Some sea slugs are very brightly coloured. This is either a warning, when they are poisonous or contain stinging cells or to camouflage them on the brightly-colored hydroids, sponges and seaweeds on which many are found. 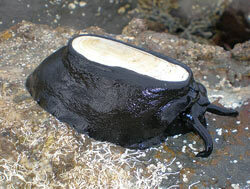 Many marine gastropods burrow and have a "siphon" extending out from the edge of the mantle . The siphon allows the animal to draw water into their mantle cavity and over the gill. They use the siphon mainly to "taste" the water to detect prey from a distance. 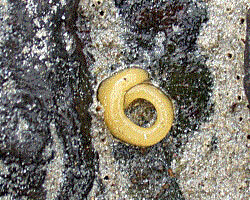 Most marine gastropods have separate sexes whilst terrestrial gastropods are usually hermaphrodites (posessing both male and female reproductive organs). 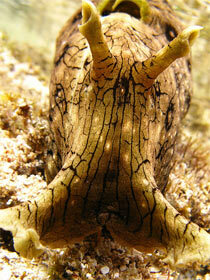 Sea Hare's are medium to very large sea slugs with a soft internal shell made of protein.